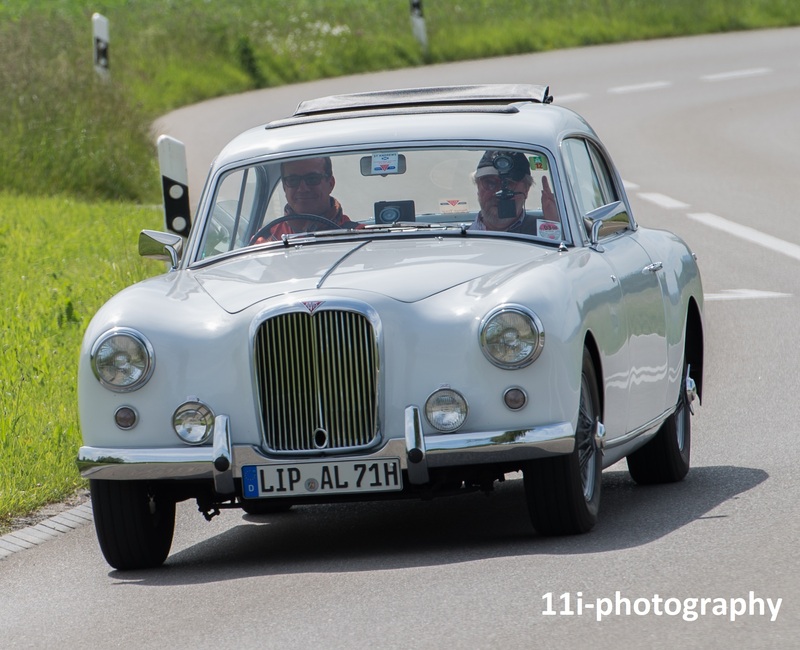 The first Alvis Jubilee Event was at Fribourg OTM 23-24 March. 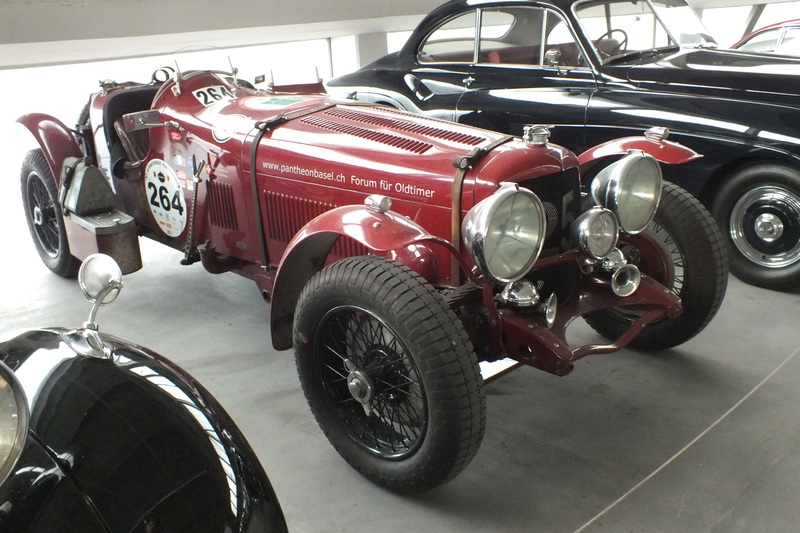 Daniel Fischlin organised two Alvis to be on show, a Speed 20 Charlesworth and a Graber TC108G. 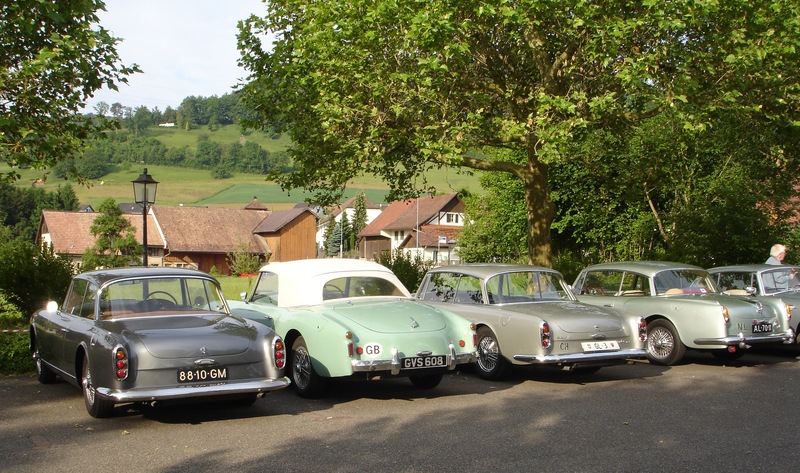 The Graber Treffen is on May 25th in the Jura. If you have a Graber and have not received details, please leave a reply. 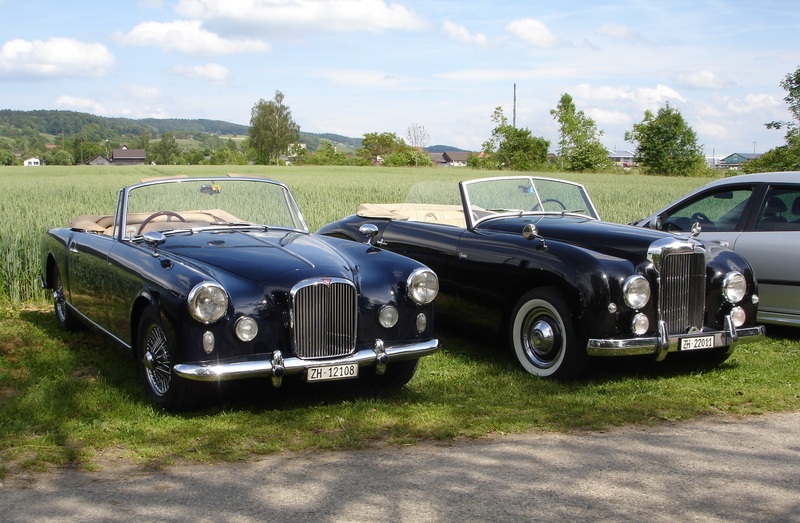 On May 25-26 the Lucerne Classic World exhibition will also include Alvis cars. 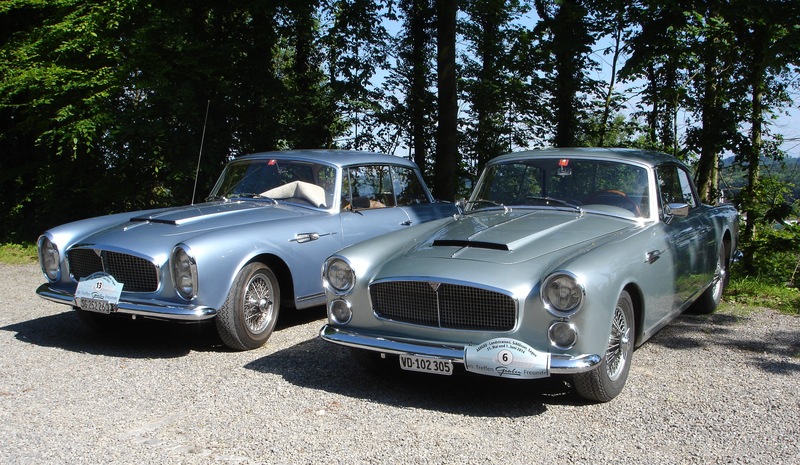 Dieter Schätti and Stefano Mastropietro are organising participation in two events with British cars as the theme: Mollis on August 25 and Morges on October 5, where Alvis joins Bentley and Mini with pride of place in the Castle grounds. 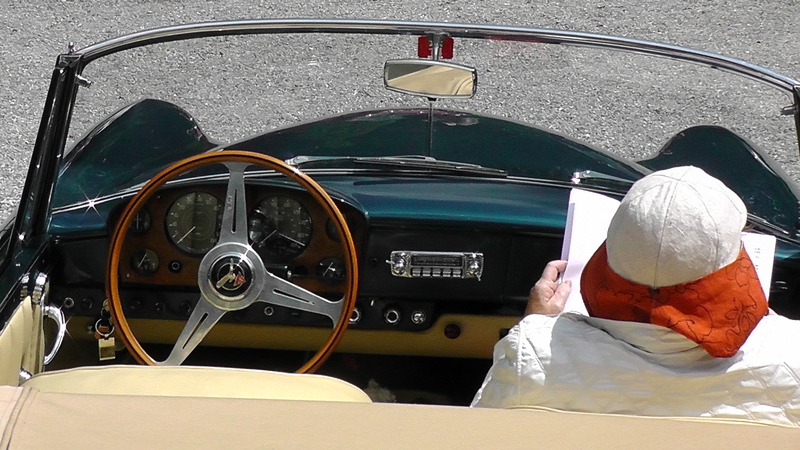 If you are interested in joining an informal group driving from the UK to Morges, please leave a reply. Whilst on the Australian Rally Richard Tonkin generously let me drive his lovely and unique Graber TA21 Coupe. 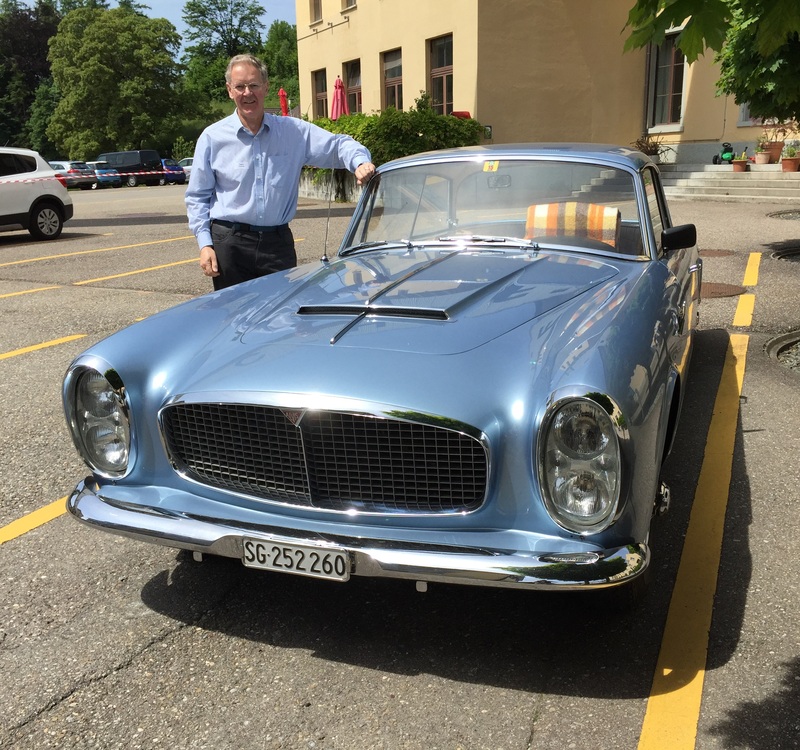 I was taken with the car – “the Graber magic”- and when I contacted John Fox he suggested that I might like to attend the Graber Treffen organized by the Graber Freunde. I was soon making arrangements to join the event. Leaving behind a very wet Bristol Airport I landed in the lovely warm sunshine that lasted the whole weekend and took the scenic train journey via Lake Neuchatel to Zurich and the hotel Swiss Star in Wetzikon. I was on the list of attendees as “ohne Auto” and rather concerned as to how I would get to the Saturday start point. My concerns were unnecessary as I soon met Manfred Fleischmann, Reinhart Dortschy, and Evyonne and Daniel Fischlin, who all offered me a lift. In the event I did rather better than those mit Auto as I had a ride in a different car on four of the five routes. My first ride was in the 1961 TD 21 Graber Coupe Super of Evyonne Fischlin. This car with its beautiful light silvery grey leather interior lived up to its name as we made our way north of Zurich to the home of Fredy Bertschi. For the first time all twenty five cars were parked together to make an impressive sight. Also impressive was the work of Fredy! 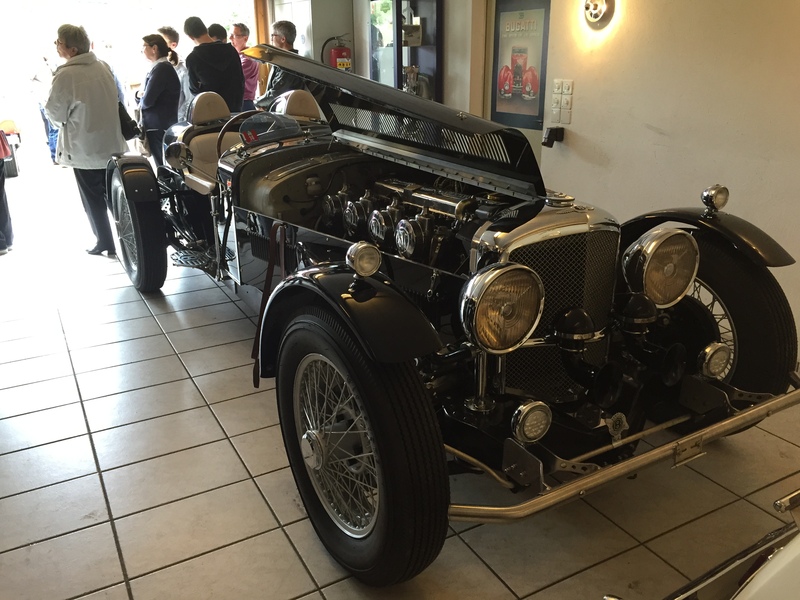 A Bentley Mark VI fanatic! Two stunning specials, a working RR turbo prop engine ( which he fired up ) , a Merlin engine (new) and a recreated rolls Royce fire engine. Oh and a Graber. Fredy might be an amateur but he’s also a genius. His work was quite stunning. 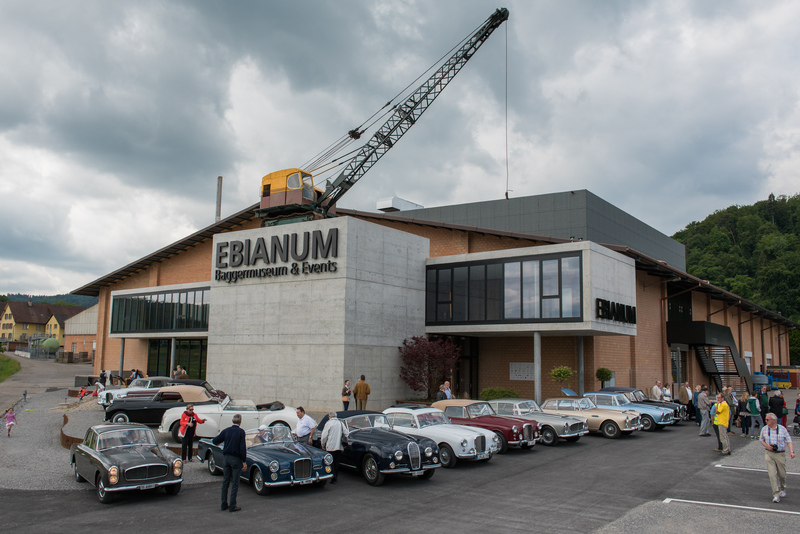 I now changed cars and made the trip to the Ebianum museum in Daniel Fischlin’s TD21 convertible Special. This had a lovely green leather interior with a zip-out rear window in the hood. Beautifully maintained, it drove like a new car. After a hearty lunch and a look round the museum (Caterpillar tractors and earth moving machinery, very well presented) I was offered a lift by Georg Schaetti in the family 1963 TD21 with its leather roof lining and extra side sun-visors. We were on our way to a micro brewery, Hopfentropfen where we enjoyed a glass of their product, before making our way back to the hotel for an excellent dinner. 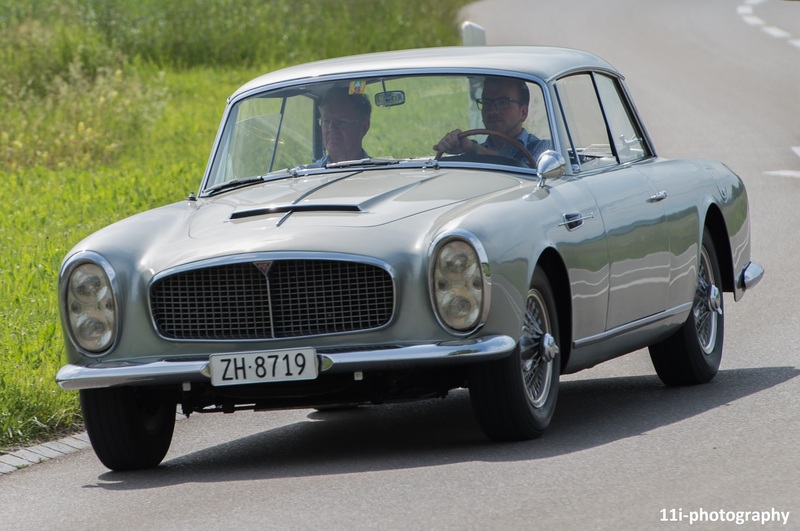 Sunday saw me in the company of John Fox as passengers in the 1964 TE21 Graber coupe belonging to and driven by Ralph Schwarz. 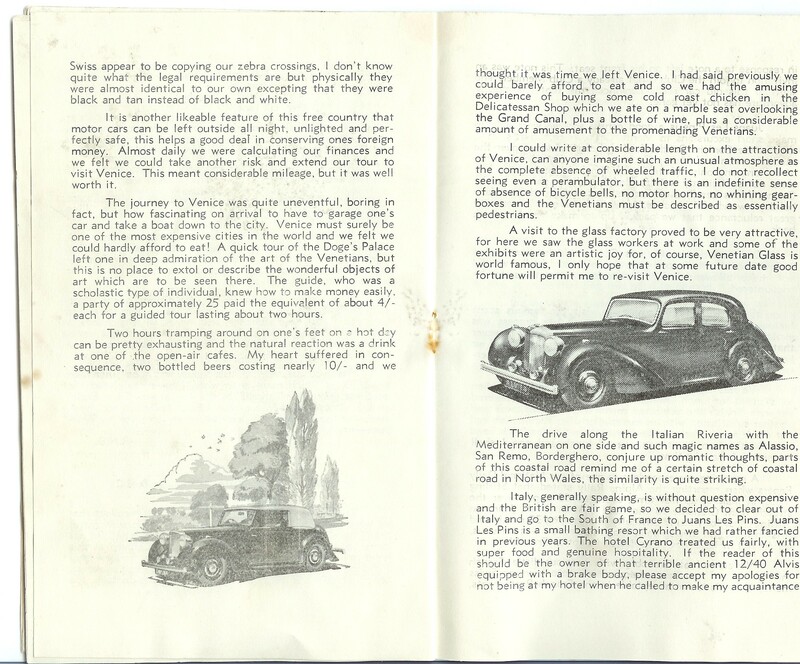 See page 67 of Dave Culshaw’s Alvis Three Litre in Detail to read his remarkable story. 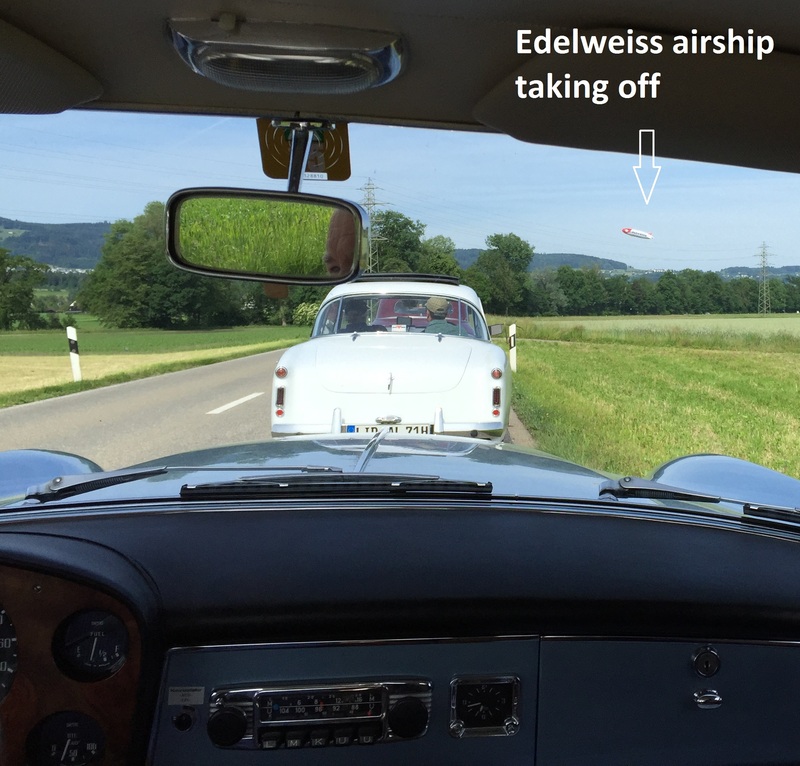 The drive took us via the shore of Zurich Lake to lunch in a converted textile factory at Wald via the launching of an air ship. And so it was time to return home with so many memories: cornflowers and poppies in the fields, the beautiful villages that normally tourists do not visit, the way Swiss drivers would allow us to remain as a convoy even when they had the right of way at junctions, and of course the lovely Graber cars. 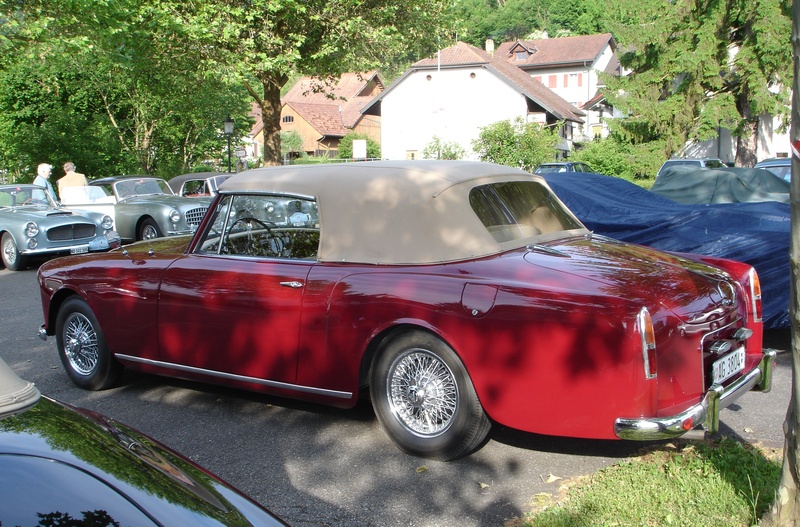 Note: not all were Alvis based and there was a Bentley, a Dodge, a Delahaye, a Lago Talbot and a stunning Alfa Romeo. My fondest memory however is of the welcoming warmth and kindness shown to me as a newcomer. Next year Basel! 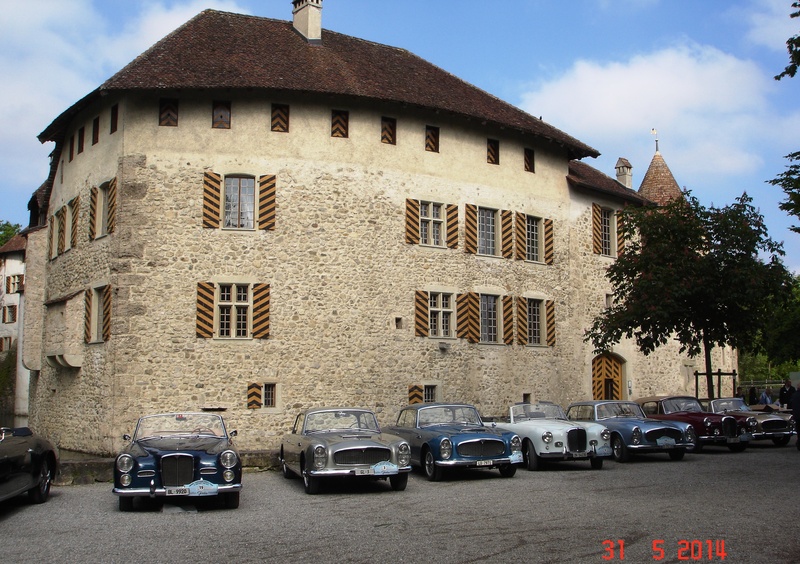 Not a lot of people know that the canton of Aargau in Switzerland has no fewer than 43 castles and the Graber Freunde visited three of them over the weekend May 31-June 1 during their 2014 Treffen, the fortieth! 17 3-litres from TA21 to TE21 met at Schloss Hallwyl www.schlosshallwyl.ch together with Bentley, Dodge, Talbot Lago, Alfa Romeo and a Mercedes Benz 500K. Participants came from Holland, UK and Switzerland. After a coffee and a croissant and a short history of the castle we set off for a twenty minute stroll to the lake, a chance to chat and catch up with old friends before boarding our boat for a short cruise and an on board quiz on castles and Graber to an early lunch of Balchenfilets at Seehotel Delphin www.hotel-delphin.ch. Bernd Reichart had arranged for Max Jakob to give us a presentation over lunch of his experiences as an employee of Graber from 1962-7 and this will form part of the forthcoming book on Graber. After another cruise and twenty minute walk back to the castle and cars we started our first road run around the lakes to enjoy typical Swiss scenery in fine weather and on to our next castle Schloss Wildegg www.schlosswildegg.ch having first driven through Lenzburg and seen its castle. The final destination was another half hour drive to our overnight stay at Schloss Boettstein www.schlossboettstein.ch close to the oldest nuclear power station in Switzerland in Beznau. This was chosen by our organiser Dr Geiger! 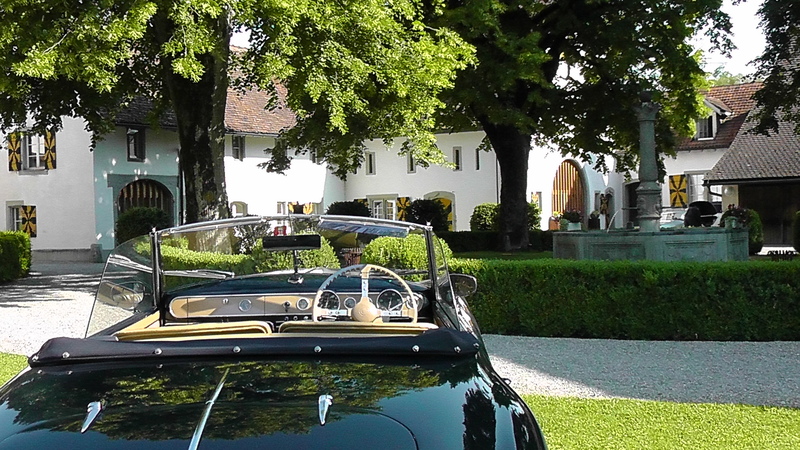 The pre-dinner aperitifs in the courtyard with the star cars (their owners won the quiz!) parked on the lawns was perhaps the “moment” of the weekend. Sunday morning dawned bright and warm but with a late breakfast and briefing at 10.15 it was a very relaxed affair. The morning drive of two hours to our final lunch in Landgasthof Hirschen Obererlinsbach was a delight of gentle countryside, some narrow roads and a few villages. On this part of the tour I had the privilege to drive a TE21 which was both low mileage and just restored. Bert Kramer was probably the first member to bring a late model Graber to an Alvis Day at Crystal Palace from Holland in the early 1970s. Bert has previously bought a second hand TD21 Park Ward direct from Graber himself and had vowed to go back and buy the real thing when he could afford it. 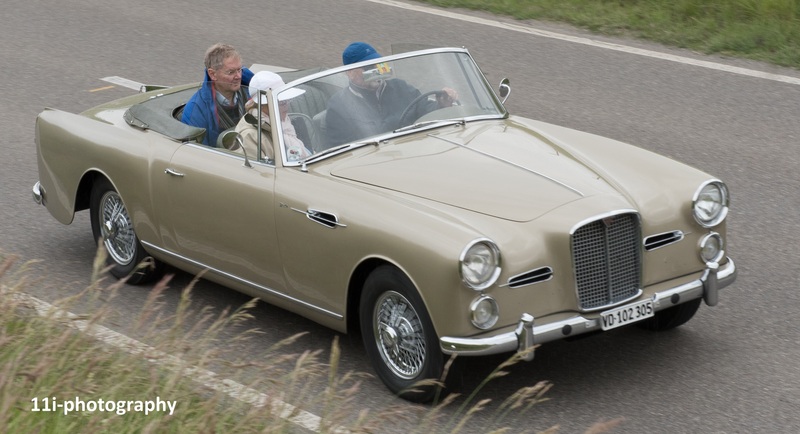 At age 50 (the car) he has treated it to a full coachwork restoration and interior retrim and, as Graber would have wished, in colours of his own choice. This car is certainly one the nicest Graber I have driven, with a quiet zf box, silky smooth engine, precise unassisted steering, smooth brakes and “as new” seats. 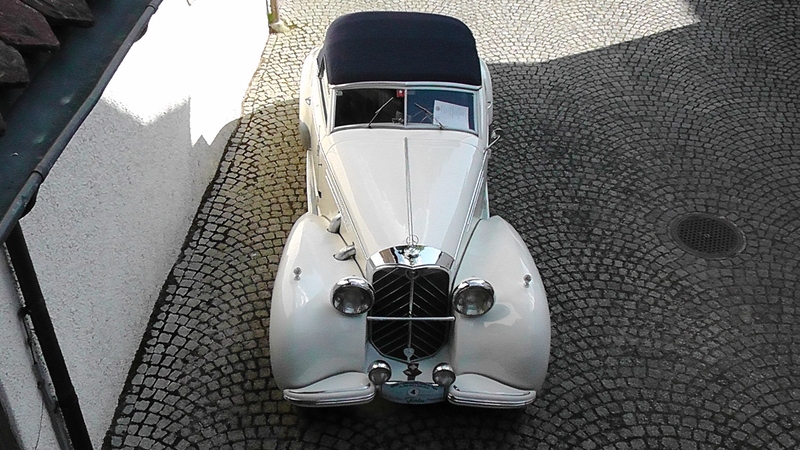 Four TE21s came, including the star car of Jerome Haegeli who in the year since acquiring it has restored both the exterior and interior. Ralph Schwarz brought his blue coupe. Lunch over and goodbyes said it was time to hit the motorway back to Aubonne in the Fischlin TD21. Not quite so much fun but at least it was still fine weather and there were no long hold-ups. 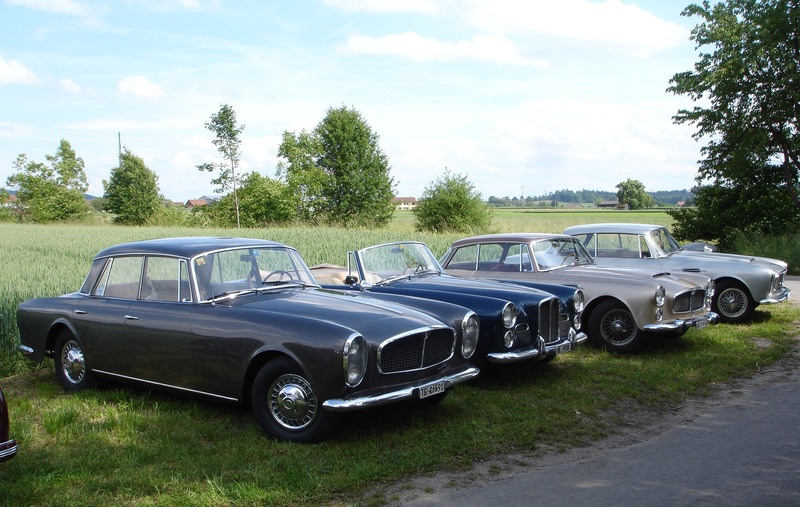 Another 400 or so miles of Swiss Alvis motoring completed in fine company. The whole weekend was extremely well organised from beginning to end thanks to Roland Geiger and Hans-Peter Gautshi. 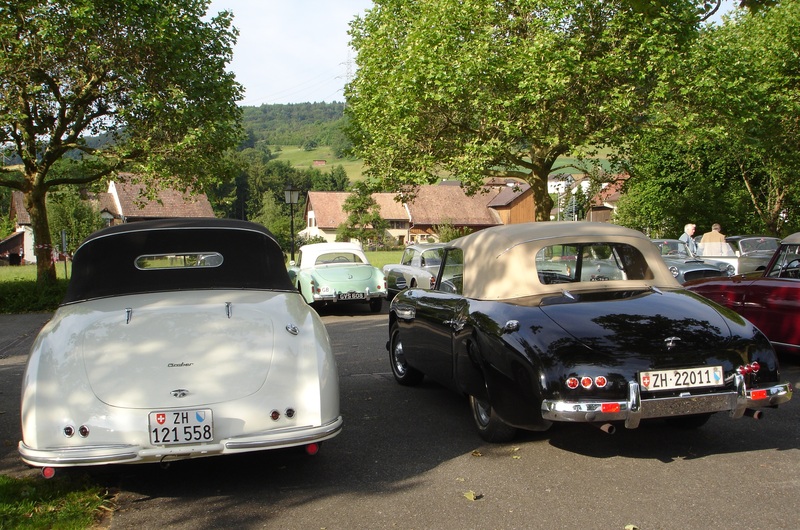 Next year’s Treffen will be at the end of May in the Zurich “gold coast” area. 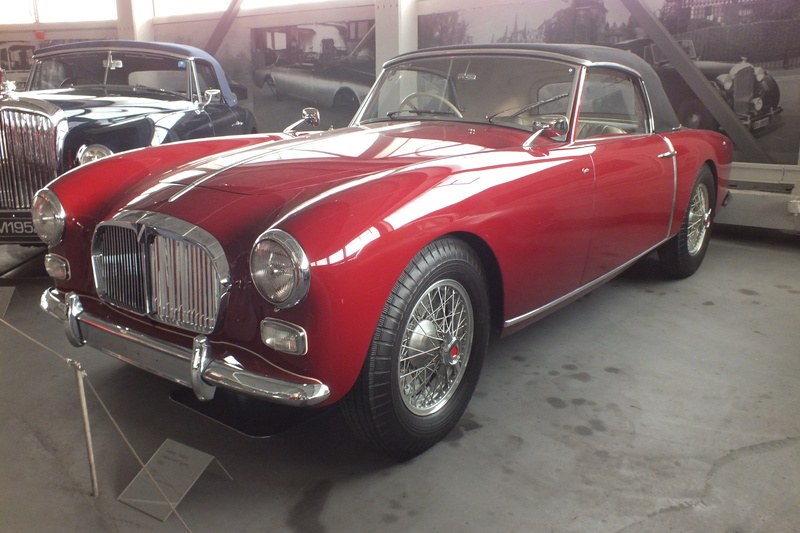 23 Friends took a coach, foresaking their Alvis, for six days in March 2014 visiting the Schlumpf Collection in Mulhouse, the Pantheon in Basel and the Geneva Motor Show. 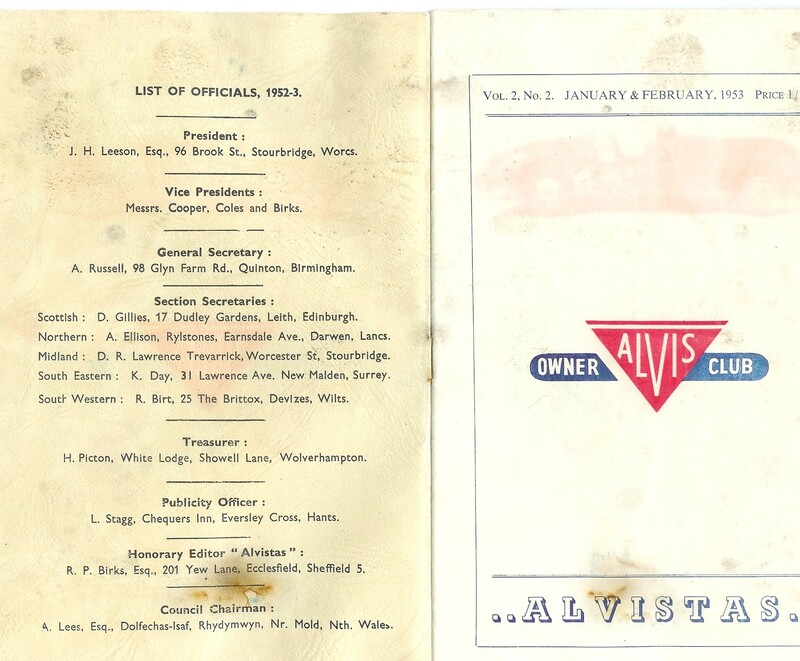 The invitation from the Alvis Archive Trust to join a coach trip to Geneva was intriguing but at first glance there appeared to be many problems. Where did it start? What did we do with the car? How long would it take us to reach Dover when we had to pick up passengers all down the A1? Finding that we could leave our car at Sutton on Trent at the coach garage, assurance that we would be in France that night and that the coach would not be full so there was plenty of room to move about and socialise; we paid the deposit. The AAT swung into action, don’t forget your travel insurance, menus for the first and last night were proposed and suddenly we were ready to go. Monday 2 March; We arrived at Sutton on Trent at 8 a.m. to find John Fox already there and Neil Millington close behind. Other passengers arrived and by 8.15 we were ready to go. We met our driver, Glen, who was the ideal person for us, a train enthusiast who owned a large model railway layout. Glen was very efficient, a fantastic driver and kept us on the right route the entire journey. First stop was the Nene Valley railway to pick up more passengers and then we made our way steadily down the country, all passengers ready and waiting when we arrived. Some were in service stations, some just off the motorway and one stop was actually at a Macdonalds! The journey flew by, you can see so much more in a coach than a car and we saw the extent of the flooding on the adjacent fields. We reached the Tunnel at 13.00, in plenty of time to visit the shops, last chance to buy an English paper and to buy a snack to eat in the tunnel. After half an hour on the shuttle we were in France! The mood in the coach was subdued as we passed signs for the towns that have been in the news so much these last days with the commemorations of World War I. The countryside changed and soon we were heading for the Hotel du Golf de l’Ailette near Laon. A peaceful spot with all rooms overlooking the lake, and we all resolved to explore the grounds on our return journey. 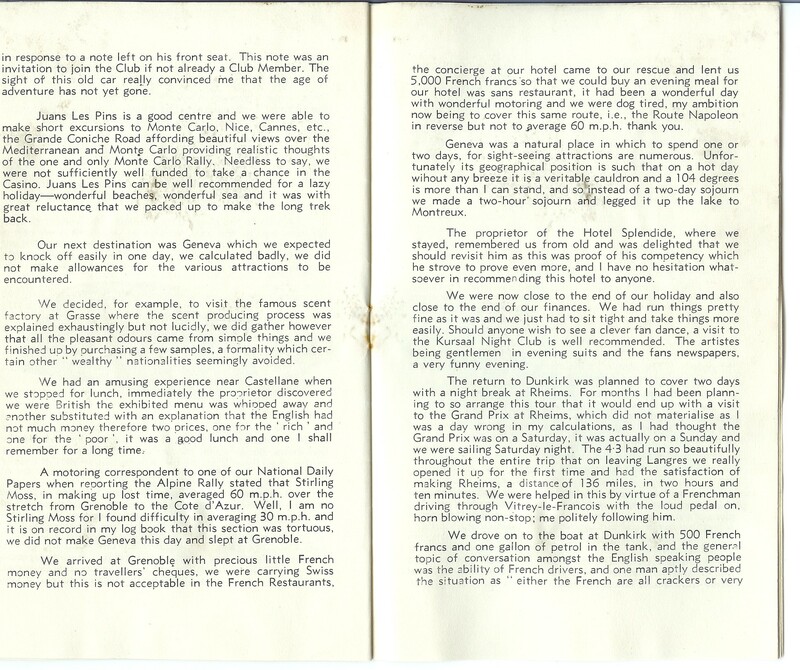 The hotel was excellent, our ordered meals delicious and a pleasant evening was had by all. Tuesday 3 March; After a delicious breakfast, we were back on the road heading towards Alsace. 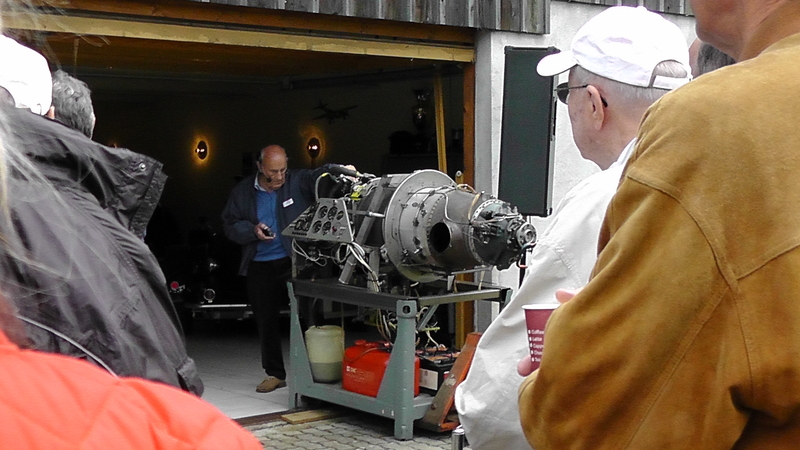 An excellent lunch stop and during the afternoon leg Adrian Padfield gave us a short talk on Capt. 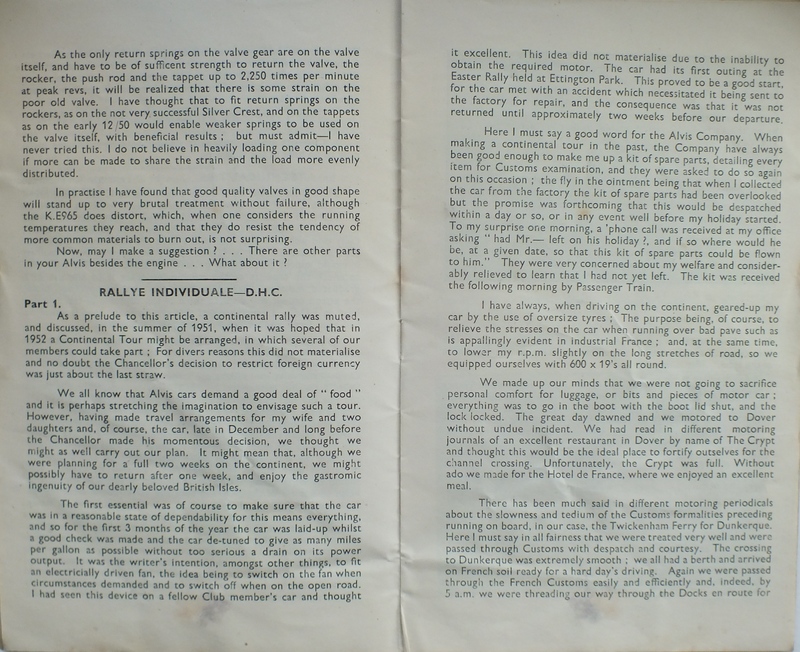 Smith-Clarke and his life with Alvis and all his other interests. We reached the Hotel Domaine du Moulin in Ensisheim in the afternoon and most of us took the opportunity to explore the picturesque town. The Hotel’s grounds were beautiful with swans, and ducks swimming in the lake. We split up for dinner, some walking into Ensisheim, some going further afield and some dining in the hotel which again was excellent. 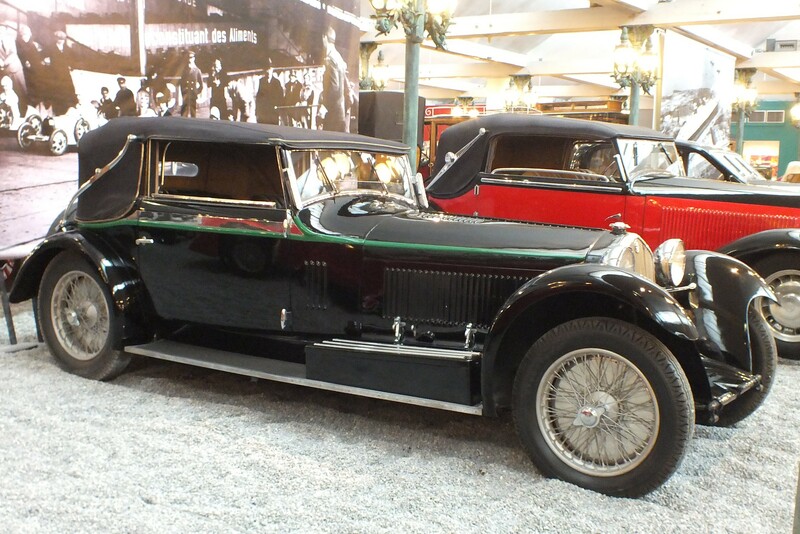 Wednesday 4 March; Just a short ride took us to Mulhouse and the world famous Schlumpf collection. There were more than 400 stunning cars, including the world-famous Bugatti Royals, covering an area of 25,000 metres. We had an excellent autoguided tour and then examined the many films, exhibits and models on display. There is now a new extension housing a modern café and other amenities and we all had a good lunch there. At 2 pm we met at the coach again for a short ride to Basel to visit the Pantheon. 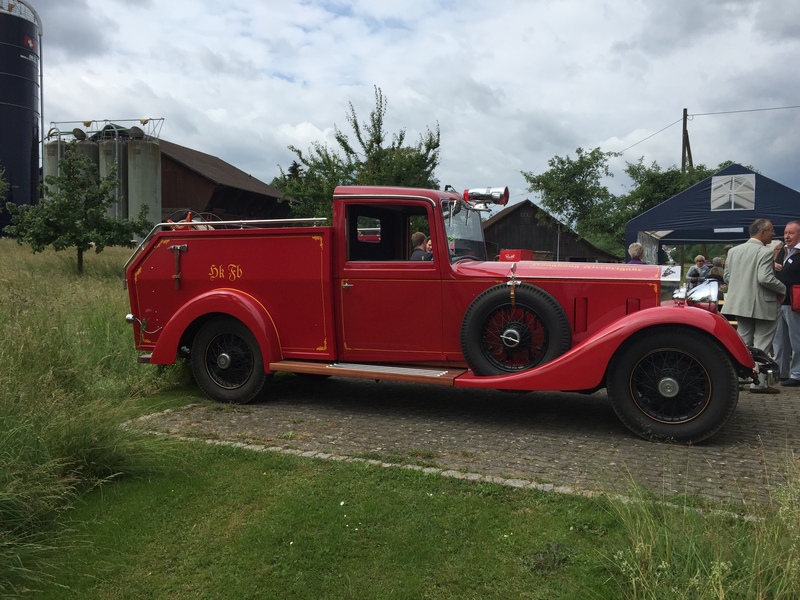 This is Switzerland’s largest classic car collection and there was a bewildering display of cars from all countries, including several Alvis. We had hoped to have a meal in the restaurant but unfortunately it did not open until too late so we satisfied ourselves with a drink and went on our way. 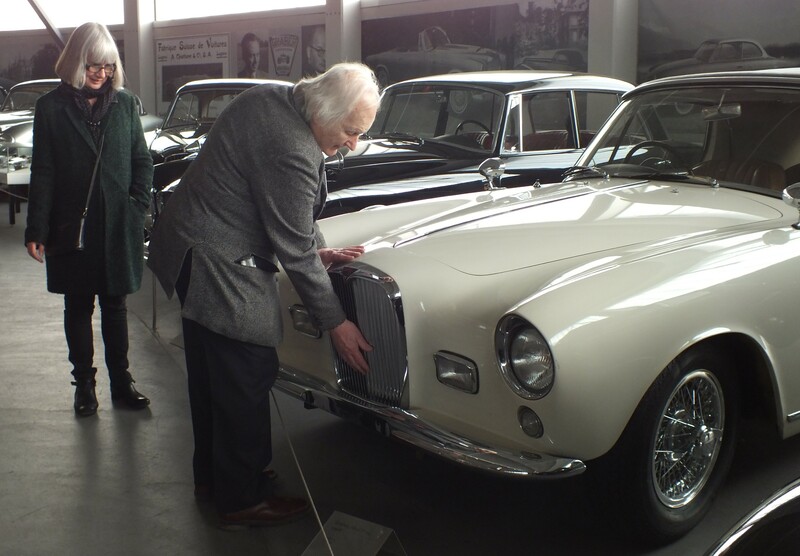 Tom Poole examines the last Graber Alvis made at the Pantheon. 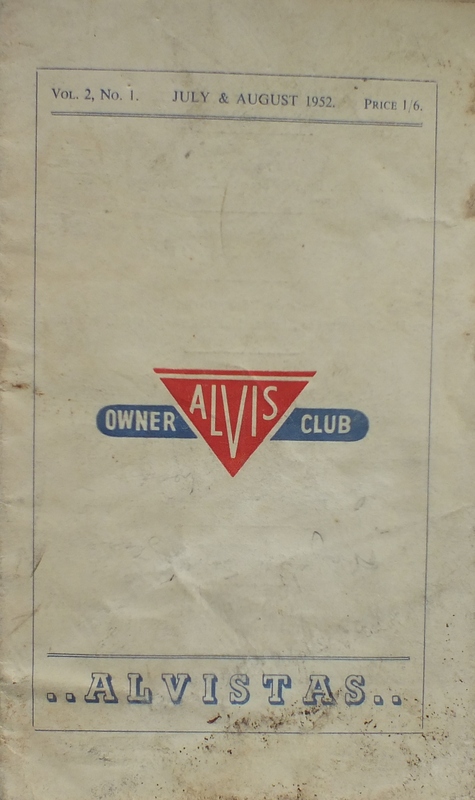 He owns the last Park Ward Alvis made. Our hotel for the night was the Ibis Hotel in Fribourg, a modern hotel with all amenities and with good access to the historic town. Some of the party ventured on to the local buses and went into Fribourg for a meal, others dined at the nearby Casino and some stayed in the hotel to have a meal there. Thursday 6 March Neil’s birthday! An early start to make sure we arrived in Geneva in good time for the motor show. We had been invited to visit the Bentley stand and this was the first stop where we had a delicious buffet and saw the latest Bentley models. After this we explored the Show individually and conversation in the coach later compared the various stands. 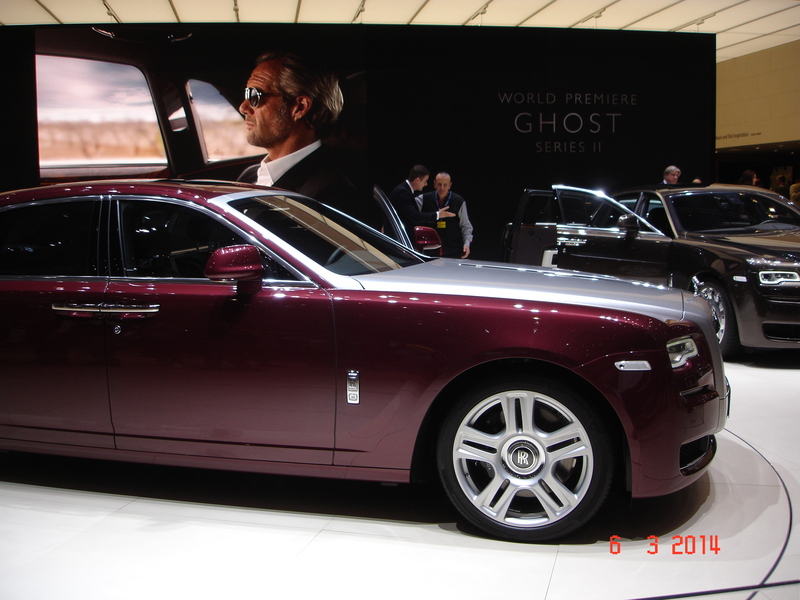 The Ghost II appeared at Geneva. 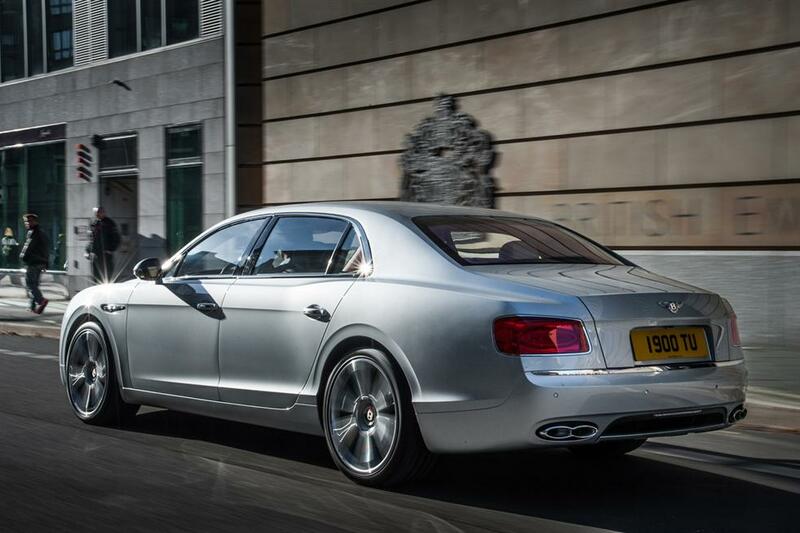 …as did the Flying Spur Bentley V8. 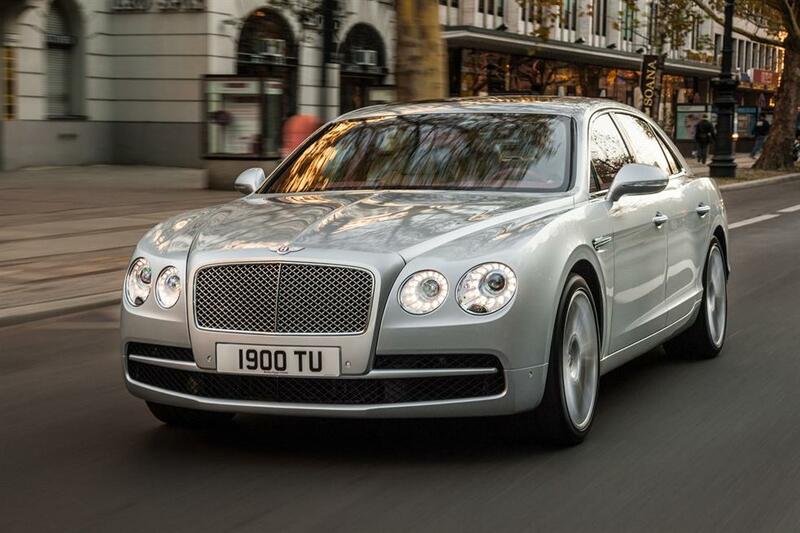 Thanks to JCT600 Leeds for our invitation to the Bentley stand. We didn’t all go to the Motor Show. Kay and David were very adventurous and first explored Friboug and then caught a train to Bern where they spent the day and found it a beautiful city. The rest of the party went into Geneva and Glen dropped us off in the town centre. Andrea guided us to the Tourist Information Centre and we all bought an explorer pass to enable us to see most of the city. Our first tour took us to the international area and the huge hotels and headquarters of international organisations such as the United Nations and the Red Cross. Then a tour of a different kind and we went into the old area and visited St Peter’s Cathedral, a European Heritage site. We took coffee overlooking the lake and then contacted the others to see what time they would collect us or should we go for a sail on the lake? They were ready to go so we saved that treat for another day. Most of us decided that we should eat in the hotel that night to celebrate Neil’s birthday and we had a very enjoyable time. The staff did not expect such a large number but did their best and I think Neil enjoyed his party. 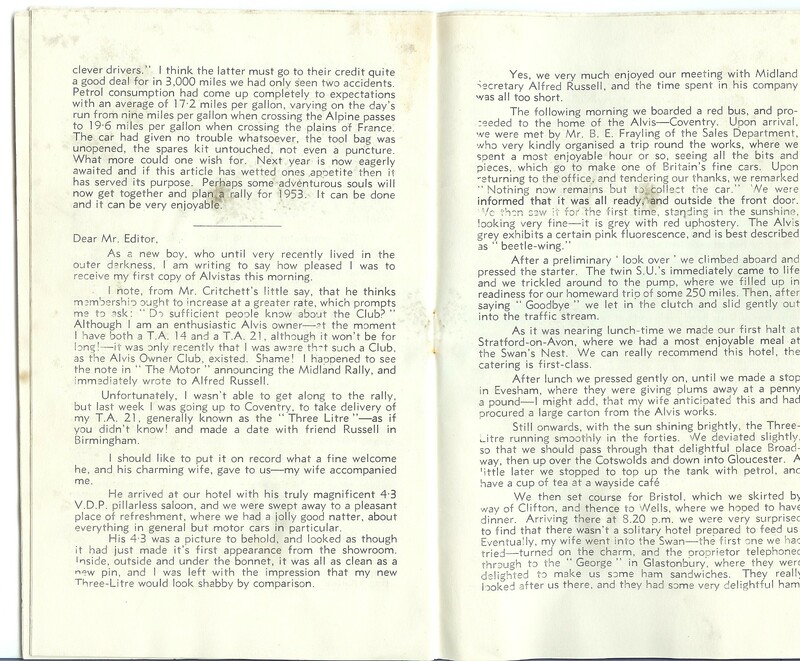 Friday 7 March Homeward bound now and John had devised a very picturesque route through Switzerland seeing snow-capped mountains and in some places snow lying at the roadside. Our coach journeys had been enlivened by appropriate music and also some videos of early motor shows. The men may have been interested in the cars but most of the ladies were fascinated by the fashions of the day! Back to the Golf hotel where we were given another warm welcome. We had hoped to visit a champagne house on the way but we ran out of time but Neil arranged for us to have a champagne reception at the hotel. An enjoyable finish to an excellent tour. Saturday 8 March Our journey back was uneventful arriving at the Tunnel again in plenty of time for last minute shopping and a quick trip through customs but the coach did have a thorough search! We had a trouble free journey up the country, dropping people off at the appointed stops with no problems. 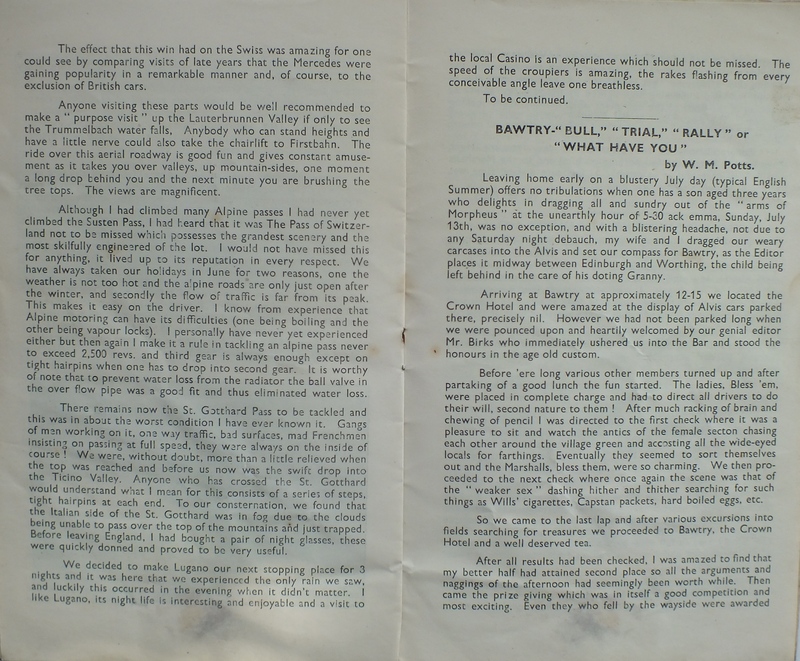 Our journey ended again at Sutton on Trent and Mr & Mrs Marshall came out to great us – Mr Marshall to show us his wonderful collection of cars and Mrs Marshall to give us a very welcome cup of English tea! Tours to Switzerland have been a regular item in the AOC Calendar. 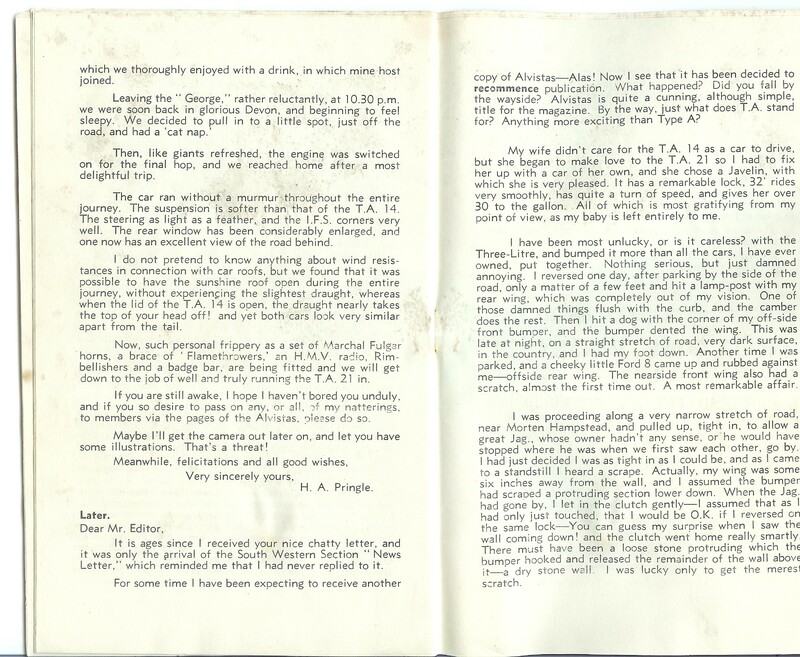 This article from “ALVISTAS” in 1952 is where it all began. Then there was a 1995 Tour, two Tours in 2005 and a further one in 2010. It seems likely to now be in Virginia USA with a long term member but we are trying to find out. 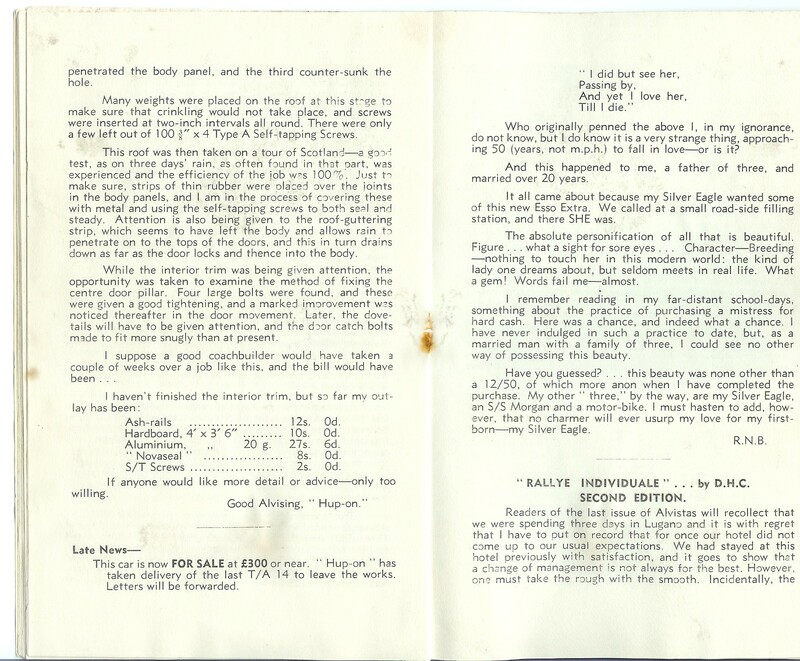 We have now posted part 2 of the article. In that he refers to scenery like North Wales so it seems a reasonable guess. 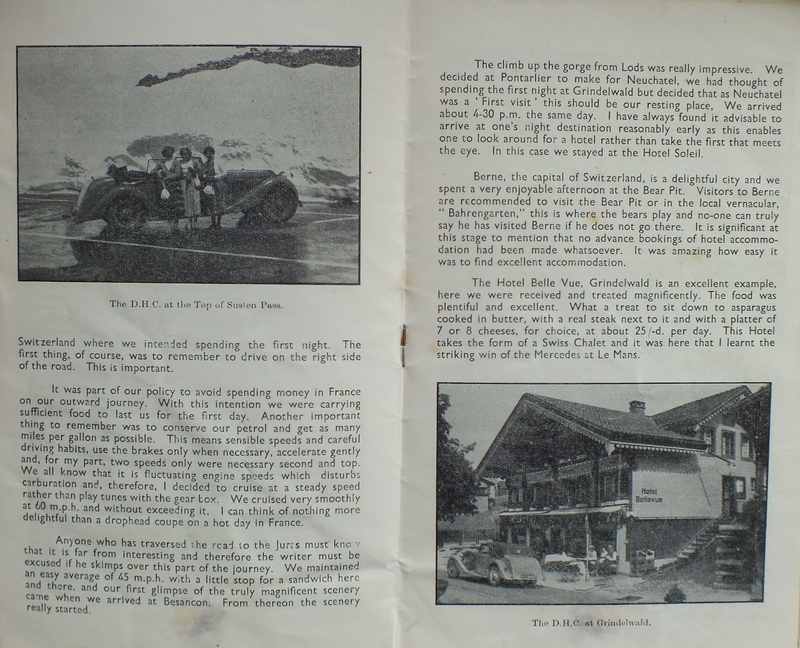 I read the article on the Swiss Tour with much interest, as it was indeed written by my grandfather, Arnold Lees, who was a co-founder of the Alvis Owners Club. It was so nice to have it as a reminder of him as he was very passionate about cars, especially the Alvis. I’m sure Grandpa would have been overjoyed to see the article still being read after all these years. Thank you, most appreciated. Would you happen to have any other material about him?